Last evening we celebrated our fifth year of publishing with a party in New York City. The crowd that showed up had a good time. Many walked away with raffle prizes. The idea for a magazine dedicated to older skiers, boarders, and snowshoers developed over several years. Living in Park City, I saw that, midweek, almost everyone on the lift was my age or older. Ski magazines, by contrast, were publishing things mostly for and about younger people. As the concept formed, I used the lift to bounce ideas. For those of you familiar with market research, the chair ride became a series of 8-10 minute focus groups. MikJone Maginn and I are friends from college. We both graduated when giant green animals with pea-sized brans were feeding from tree tops. Following graduation, he spent time on the editorial staff of Skiing Magazine. We stayed in touch over the years, and I suspected that despite a busy consulting practice, he might have some time. He understood the concept immediately – a growing cohort of older skiers without a core. Would he be interested in partnering? The next day he agreed, and we immediately started to plan. 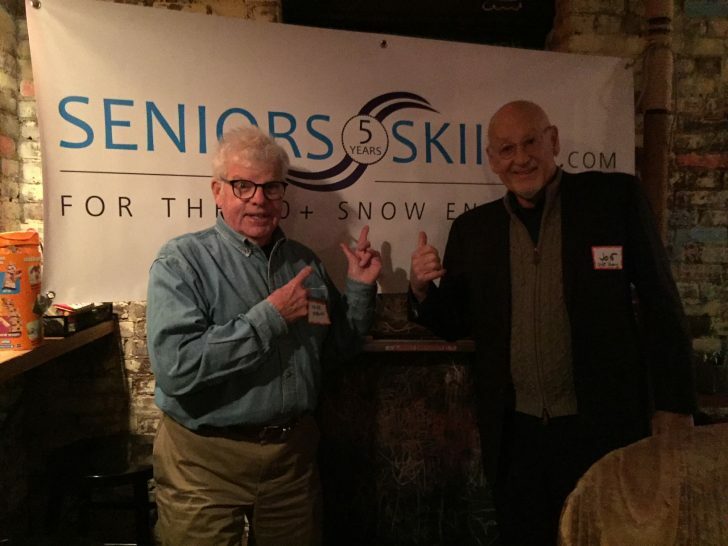 SeniorsSkiing.com launched less than a year later with zero subscribers. As we enter our fifth year of publication, we have subscribers, worldwide, who, last season, generated up to 50,000 monthly page views. The numbers keep growing. The earliest advertisers – Masterfit, DeBooter, and 70+ Ski Club – have been joined by others wanting to reach active, outdoor-oriented seniors. SeniorsSkiing.com is a true labor of love. Contributors aren’t paid, but they like to share their experiences and stories with an ever-growing audience. We go through considerable effort to publish annual lists of areas where seniors can ski free, the best skis for seniors, and the best boots for seniors. 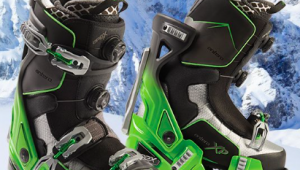 Realskiers.com and Masterfit provide the data for the ski and boot lists. The party last evening was terrific. Numerous attendees told us they made plans to ski with new friends they met there. Several walked away with excellent raffle prizes, including a four-day trip to Okemo Mountain in Vermont (courtesy, 70+ Ski Club), a pair of Apex ski boots, and two Orsden parkas. Others won DeBooters; Bootsters; GearBeast cell phone holders; Buffalo Wool Company bison wool socks; Safe Descents, ski and snowboard insurance, and lift tickets to Powder Mountain in Utah. The SWAG tables were heavy with materials from Skiing History Magazine, Powder Mountain, Solitude, Ski Pennsylvania, Mont Saint Anne, and Sunday River. The person travelling the longest distance to get there was Mauro Cevolo of Alpskitour. He came from the Aosta Valley in the Italian Alps, where his company conducts weeklong guided skiing to Courmayeur, Mont Blanc, Zermatt, and other snow-covered marvels, returning each night to a classic hotel in the scenic town of Saint Vincent. You’ve helped us get to five years. 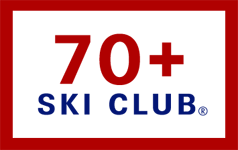 Please tell your older skiing friends about SeniorsSkiing.com. As for our part, we plan to keep you informed with relevant and timely information of interest to the older snowsports enthusiast. News of resort openings from the mountains. Salomon released this clever video of French racer, Victor Muffat-Jeandet competing on a GS course against champion drone racer, Jordan Temkin. Most resorts have no-drone policies, but Snowbird, where this was taped, must have given special permission. Short and amusing, with a surprise end: click here. Over the next month, I’ll highlight unique and useful gift ideas for older skiers.. The following, which I’ve mentioned before, advertise on SeniorsSkiing.com. Simply click on the ads to reach the sites. GearBeast is a $9.95 rubberized cellphone carrier, worn around the neck and with a small pocket to hold ID, a credit card and some cash.I’ve been using it for several months and consider it essential. I no longer misplace the phone. Equally important for skiers is that there’s no way you’ll drop the phone on the lift. Because it’s around the neck and under the parka, the battery doesn’t drain lie it does in a parka pocket. Mine is black, but GearBeast comes in a variety of colors. A very good item. DeBooter is a skiboot jack.I keep mine in the car and loan to others in the lot. It works extremely well, even with stiff, cold boots. Your foot comes right out without difficulty or pain. One of my friends reports that his grandkids love his DeBooter. $39.95, less 20% SeniorsSkiing.com discount. Safe Descents is emergency ski and snowboard evacuation insurance.It covers ambulance or air evacuation services if injured in-bounds at any ski resort in the United States. That’s in addition to other coverage like sending a loved one to the hospital and/or getting back home following a hospital stay. These and other benefits have a maximum of $25,000. A thoughtful gift to drop into any stocking. $56.99 for the season. New products sure. I bought the Booster immediately for myself and a few Debooters for gifts. Absolutely no interest ib skiing history. Im not going to buy new skis or look at ski reviews at my age. Skiing is expensive.. I have no interest in going to a place just because its free or 20% discount. I love reports on ski resorts. Not the best restraunts but where can you pee and what trails are crap. This week.Vail sent a special e mail price discount for rooms until Decemper 15. The Aribell only $1,500 a night. Yeah right. I want info for the cheapest rate for one person and secret unknown good room deals. Im flying to Keystone in two weeks to ski 3 days. Im by myself. It would be nice to join up with a few guys mostly for safety reasons . How???? You can get a 25% discount if you bring in a Pittsburgh Steeler Terrible towell to some of the the ski shops in Beaver Creek. Thats what I look for. What hospitals are good? What doctors? I know from several occasions that the Steadman clinic in Vail is supburb if you thing a bone is broken. Ive been to some resorts that have many rude , lazy, ignorant, and unlikable employees. I wish to avoid going to any new ones. Mean guy. Why would I want to ski with him? I’m close, real close to the same age. Bought boots last year, looking for new skis this year. As to nasty employees, all kids are nasty at our age, or patronizing. Deal with it. We were all obnoxious brats when we worked the resorts. Anyway. Nice mag. I love it. It was great to meet you at the party and find we are neighbors. Second door prize I won this year, I met a fellow there from my industry. We never knew we skied. I enjoy your website and hope to connect with other skiers. Yesterday’s blizzard confirmed I can still drive in the snow. Hope to get off the couch and on to skis soon. Yes, fine mag indeed – I love it! Larry, if you are looking for cheap, consider Jackson Hole. First, remember, the biggest expense for destination skiing will always be lodging. On-slope digs at JH are as stupid-expensive as anywhere else, BUT, the very-fun town of Jackson is an easy 12 miles down the road, and, since it serves primarily as a SUMMER resort town, has plenty of off-season-cheap, decent, motels, at the ready. If you fly in, you can commute to the resort on the easy and efficient local bus, or, rent a car at the airport – it will cost way less than the on-slope vs. town cost diff, and you can go anywhere you want, at will. The Hostel at jackson hole, right in teton village, is cheap and only a couple doors over from the tram… bunk/share rooms or privates. full kitchen, ski tuning facilities, hot tub, fun people there most of the time. ‘luxurious’ it aint, but the private rooms w bath are one of the best lodging deals in ski country. I ski at Eldora Ski Resort near Boulder, CO. All the lift attendants, ticket checkers, etc. are young, but are super friendly, super happy, always wishing you a “great run” or a “super day.” It makes a wonderful day of skiing even better. Eldora was purchased a couple of years ago by the Powdr Corp. and has done some major upgrades, including more and better snowmaking and a new high speed 6-person chair lift. It’s a great smaller resort and close to Boulder, which is a fun town to visit.